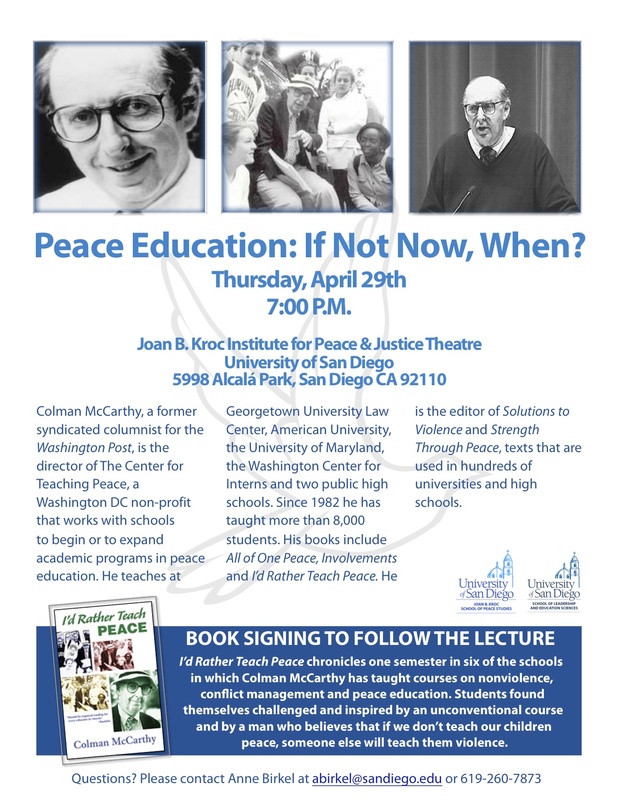 Date & Time: Thursday, April 29th 7:00 P.M.
Colman McCarthy, a former syndicated columnist for the Washington Post, is the director of The Center for Teaching Peace, a Washington DC nonprofit that works with schools to begin or to expand academic programs in peace education. He teaches at Georgetown University Law Center, American University, the University of Maryland, the Washington Center for Interns and two public high schools. Since 1982 he has taught more than 8,000 students. His books include All of One Peace, Involvements and I’d Rather Teach Peace. He is the editor of Solutions to Violence and Strength Through Peace, texts that are used in hundreds of universities and high schools. Colman McCarthy will inspire everyone–especially educators, students, parents, and community organizers–regarding the importance of incorporating peace education into our daily lives. The event is co-sponsored by University of San Diego’s: Joan B. Kroc School of Peace Studies and the School of Leadership and Education Sciences (SOLES) and the Peace Education Group: Arising. The event is free and open to the public. There will be a book signing after the lecture at 8:15 p.m.